After ten glorious days, we sadly left Nevis. However, before we departed, we had a proper Christmas feast at Bobby’s house. Bobby laid out quite a spread with all of the traditional goodies: turkey, gravy cranberry sauce, mashed potatoes, stuffing, sweet potato casserole, corn, green beans, bread, pecan pie, etc. Too much food to fit on your plate! Everything was delicious. Pirate, Cajun, Bobby and Dustin (the Americans in the crowd) ate themselves into a food coma and vegged out in front of the TV for the Arizona-San Francisco MNF game. Thanks again Bobby for being such a gracious host to us while we were in Nevis! We finally tore ourselves away from Nevis and sailed to the tiny island of Saba. When we arrived, we found that we were the only sailboat there. We picked up a mooring ball right off of a 3000 foot cliff. There is no anchoring in Saba as the entire coast is steep-to. Unless you have 300+ feet of anchor chain, you need to pick up a mooring ball. We accidently picked up the only mooring ball that is made for boats up to 150 tons. We didn’t know it at the time, but as soon as Cajun tried to lift it, we found out! That ball must have weighed 100 pounds! We secured ourselves to the monster mooring and were soon glad that we picked that particular ball! This was by far the scariest and most rocky anchorage we have ever been to. During the entire night we were making circles around and hobby-horsing on that ball. The swells were huge and the waves were crashing into the cliffs 30 yards away. Neither of us got any sleep. We were beginning to understand why we were the only boat there. The next morning, we seriously debated whether to just sail off and skip a tour of the island or to go through the entire process of lowering our large dingy in the 10 foot swells. Pirate was feeling adventurous and we opted to go explore Saba. It was one of his best decisions! We made the 2 mile trek to the pier in the perilous waves and once we were ashore, all was well. Luke at customs took great care of us and hooked us up with Wayne who gave us a tour of the entire island. Saba is truly a unique place. It is a volcanic rock with no sloping coastline or beaches. Everyone lives perched atop the rock at 3000 foot elevations. No matter where you are, you have an incredible view. The island is tiny with only 1500 inhabitants. But those inhabitants and their ancestors fought hard to establish themselves and perfect their way of life on this rock. 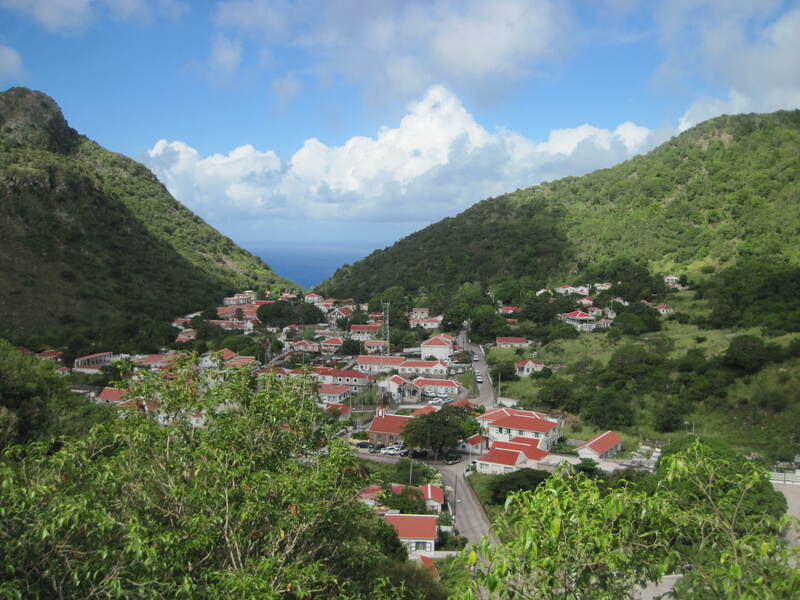 Prior to 1940, there were no main roads on Saba. All cargo coming in had to be hauled up a series of 1000+ steep steps from the sea. From there, cargo was hauled by donkey to the different towns. Many engineers came to Saba and told the locals that a road was impossible to build on this steep volcanic terrain. Unwilling to accept “impossible’ as an answer, one local with only a fourth grade education, enrolled himself in correspondence courses in engineering and road design and took it upon himself to start construction. The road took over 30 years to build, but it now crosses the entire island and was built completely by hand. Amazing! Especially when you see the road and how it meanders through rugged and steep terrain. Also amazing is Saba’s airport- if you can call it that. The landing strip is only 200 feet longer than an air-craft carrier. Saba was truly idyllic, like stepping into a Disney fairytale where all of the homes are the same colors and all of the flowers are in bloom. Everyone was friendly and happy. There was no poverty, no trash, no stray dogs. Only manicured lawns, fantastic views, and quaint shops and restaurants. We were so glad that we made the extra effort to visit this island! After our tour, it was back to boat. But this time we were less afraid, as we knew the mooring ball would hold us. After witnessing a fantastic sunset, we let the waves rock us to sleep. The sea seemed less angry and Saba put us in the right frame of mind.